On Tuesday Deutsche Bank upgraded Walmart to buy from neutral based on strength in online grocery sales. Analyst Paul Trussell also raised his target on the retailer to $113, a 16% upside from Tuesday’s close. On Tuesday Deutsche Bank upgraded shares of Walmart to buy based on strength in the online grocery industry. In a note to clients analyst Paul Trussell wrote that the retail giant is "reaping returns on the many years of investment in e-commerce and customer service" and that the company is "best positioned to continue to take both mind and market share going forward." Trussell also raised his target on the stock from $89 to $113, which is a 16% upside from Tuesday's closing price of $97.08. Nuveen Managing Director Stephanie Link agrees that Walmart's digital investments and acquisitions (Jet and Flipkart, among others) are a step in the right direction, but she thinks Deutsche Bank's call is "a little early" since the company still has some way to go before it can deliver bottom-line growth. "They [Walmart] have just started to make these investments, and you're just starting to see some results, but I think it's going to take a long time…I think the environment is competitive and I think what Walmart is doing is right, but I don't necessarily want to own the stock," she said on Tuesday's "Halftime Report." In the big-box retail space Link prefers Costco, which has risen more than 20% this year compared to Walmart's 2% drop. Virtus Investment Partners' Joe Terranova, on the other hand, owns Walmart since he believes the stock has momentum going forward. Like Stephanie Link, he acknowledges that it will take a while for the company's e-commerce investments to really pay off. But he thinks Walmart is well-positioned for the long-term. Specifically, Terranova is watching the stock's upward trend over the last three years. "I like to look at Walmart as a $55 stock in 2015 and see how it rallied coming into 2018...This is a name that over the last couple of years has accelerated off that $56 base. You're seeing the momentum. You're seeing the jet.com acquisition, you're seeing the Flipkart acquisition - the $13B that they spent there. You're buying alongside of it." He did, however, acknowledge that investors will have to be patient with this stock, saying "it's absolutely a slow money trade." Deutsche Bank's bull case on Walmart centers around growth in online grocery sales, which Pete Najarian believes is exactly where the company should not be focusing. Najarian prefers Target, which he owns, since the Minneapolis-based company is working to improve its higher-margin revenue streams. He also prefers Target since it trades at a discount to Walmart -- 15.4X forward earnings, compared to 20X. "There is no choice here, the choice is Target," he said. 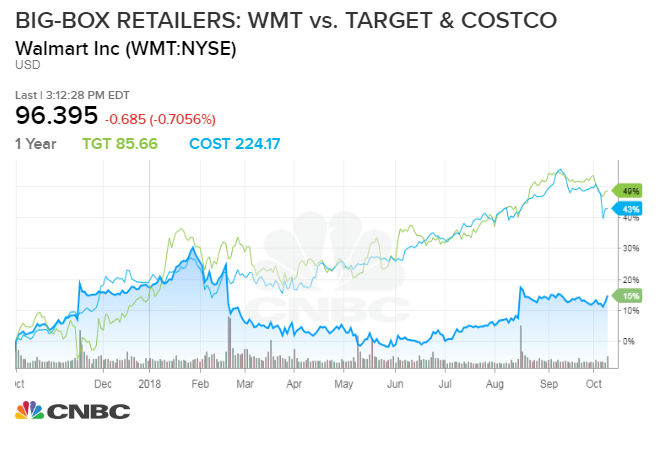 Shares of Target have soared more than 30% in 2018, while Walmart is down 2% on the year.